Planned this cruise about a year out based on some friends that were going to be onboard with us. They didn&apos;t end up making it but we still decided to go based on the itinerary. We flew into San Juan 3 days before the cruise and we were able to enjoy the island before getting to the ship. Glad we did, because this time of year is known for bad weather. We were also informed on the first and only sea day that some had missed the ship in PR because of the weather delays and were having to catch the ship in Barbados. One more reason why I would never recommend flying on the same day. On embarkation day, I will say this is the smoothest and quickest that I have ever boarded a cruise. We arrived at the port about 20 minutes before our scheduled 12:00 boarding. Waited just a few minutes to drop off our bags and then through security. Once inside, we were immediately waited on to get our room keys and then proceeded directly upstairs. Past cruises we have had to wait to be called in groups. Not so this time as we boarded the ship immediately. We were onboard before noon and even had to wait for the Venetian dinning room to open for lunch. They made several announcements that rooms would be ready between 2-2:30, however, I think they actually had them ready right at 2 which was great as we were able to get right in with little wait time. Now, for the ship itself and itinerary: - This is one of the smaller ships in the NCL fleet so it was not hard to get around. And crowds weren&apos;t as bad as they sometimes are on the bigger ships. - We had a balcony room on deck 10 and it was worth every bit of it. Small, but still plenty of room for what the two of us needed. Which was a place to sleep, shower, and relax for a little bit. - Richard Matic (cruise director) was everywhere. Him and his crew did an awesome job at bringing the entertainment. - With the exception of breakfast, NCL continues to impress me with the food. Either this ship didn&apos;t offer it, or NCL changed some recipes on breakfast. In the buffet, the omelets were too greasy, and the pancakes tasted like they had been sitting out way too long. Some other little things had also changed about the breakfast but overall, meals were fantastic. - Would have liked at least one more sea day on the back end or in the middle, as this was filled with 6 ports in the 7 days. - Antigua was probably one port that we could have done without. 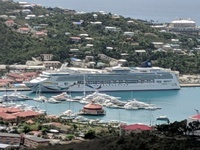 This was the one of two ports (St. Thomas) that we decided not to do an excursion on and I wish we would have. Not a whole lot to see or do on the island without an excursion. Also the poverty on the island was sad to see and that was just outside the port. Spoke with others that had done an island tour and they had said it only got worse the further away from St. Johns. - Other ports along the way were fantastic. Even while some were still recovering from the hurricanes, they still offered a lot. Overall, would go again on NCL. Would more than likely not go on the Dawn again unless it was the itinerary that I was looking for. I personally like the ships that are a little bigger and offer more to do. Any day cruising is still a good day. Planned this cruise about a year out based on some friends that were going to be onboard with us. They didn&apos;t end up making it but we still decided to go based on the itinerary. We flew into San Juan 3 days before the cruise and we were able to enjoy the island before getting to the ship. Glad we did, because this time of year is known for bad weather. We were also informed on the first and only sea day that some had missed the ship in PR because of the weather delays and were having to catch the ship in Barbados. One more reason why I would never recommend flying on the same day. On embarkation day, I will say this is the smoothest and quickest that I have ever boarded a cruise. We arrived at the port about 20 minutes before our scheduled 12:00 boarding. Waited just a few minutes to drop off our bags and then through security. Once inside, we were immediately waited on to get our room keys and then proceeded directly upstairs. Past cruises we have had to wait to be called in groups. Not so this time as we boarded the ship immediately. We were onboard before noon and even had to wait for the Venetian dinning room to open for lunch. They made several announcements that rooms would be ready between 2-2:30, however, I think they actually had them ready right at 2 which was great as we were able to get right in with little wait time. 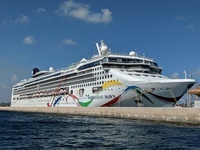 - This is one of the smaller ships in the NCL fleet so it was not hard to get around. And crowds weren&apos;t as bad as they sometimes are on the bigger ships. - We had a balcony room on deck 10 and it was worth every bit of it. Small, but still plenty of room for what the two of us needed. Which was a place to sleep, shower, and relax for a little bit. - Richard Matic (cruise director) was everywhere. Him and his crew did an awesome job at bringing the entertainment. - With the exception of breakfast, NCL continues to impress me with the food. Either this ship didn&apos;t offer it, or NCL changed some recipes on breakfast. In the buffet, the omelets were too greasy, and the pancakes tasted like they had been sitting out way too long. Some other little things had also changed about the breakfast but overall, meals were fantastic. - Would have liked at least one more sea day on the back end or in the middle, as this was filled with 6 ports in the 7 days. - Antigua was probably one port that we could have done without. This was the one of two ports (St. Thomas) that we decided not to do an excursion on and I wish we would have. Not a whole lot to see or do on the island without an excursion. Also the poverty on the island was sad to see and that was just outside the port. 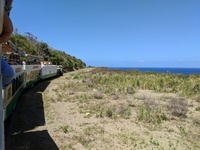 Spoke with others that had done an island tour and they had said it only got worse the further away from St. Johns. - Other ports along the way were fantastic. Even while some were still recovering from the hurricanes, they still offered a lot. Overall, would go again on NCL. Would more than likely not go on the Dawn again unless it was the itinerary that I was looking for. I personally like the ships that are a little bigger and offer more to do. Great cabin if traveling just as a couple. On a ship I only like the cabin as a place to sleep, shower, and briefly relax. Too much stuff going on around the ship to stay in it too long. This was the perfect cabin for that while still getting a view and being able to step out on the balcony to take in the sights. Not much to do in this port. Get an excursion if visiting here. Fantastic time onboard the Jolly Roger. With even a little bit of time before the excursion to look around the shops at the port. Not much time on the back end as they get you back to the port when the ship should be all onboard time. Great island to visit with lots to do. Food was amazing. Double decker bus company needs to update the recording that they play. Good stops though along the way at Toppers Rhum, the Carousel, and the Cheese store.